The CRA is continually researching and applying for grants and funding opportunities to develop new and exciting projects for the residents of Lake Worth. This is especially true when it comes to the development of new green space. In June 2013, the Dr. Pepper/Snapple Group and national non-profit KaBOOM! awarded the CRA a $15,000 'Let's Play' Community Construction Grant. The grant is part of 'Let's Play', a community partnership led by Dr Pepper/Snapple Group to get kids and families active nationwide. "Lake Worth has seen so many improvements these past few years but further development of the Tropical Ridge Fitness Park has special meaning to me. 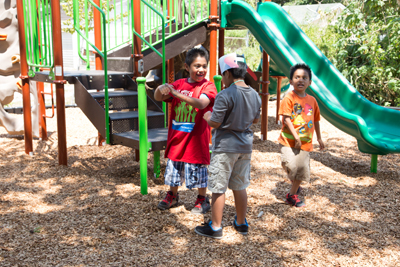 This grant will enable the Agency to fulfill a promise made to the neighborhood that included the development of park space for adults and children. Parks offer residents a quantifiable range of advantages including quality of life, neighborhood vitality and economic benefits", stated Cary Sabol, CRA Chair. "I am both proud and thankful to our Board and Staff and the many partners in this project including the Tropical Ridge Neighborhood Association, who never tire in improving the sense of pride and identity in our community." The playground was built using the KaBOOM! community-build model, which requires using community volunteers to plan, design, fundraise and build the community playground. The CRA opened the new park May 2014.